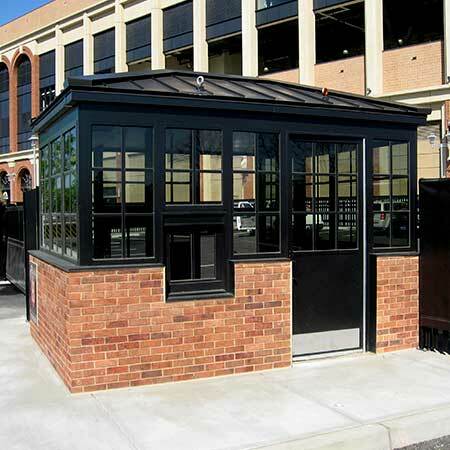 Portable Steel Building Options from Little Buildings, Inc.
Often, at no additional charge, we may be able to move the door to the opposite side of the buildings to suit your sidewalk or traffic patterns. We can blank out windows to give you wall space for coat hooks, key racks, electrical equipment or files. Sliding ventilation or transaction window can be strategically placed to best serve your clients. Each building starts from scratch so we can easily modify a standard structure in the drawing stage to make our building work for you! Here are some door standard features: Most models come with a standard sliding aluminum door. The first upgrade might be a steel door for more security. Both doors features a maximum security hookbolt lock with a rekeyable mortise cylinder on the outside. This feature allows you to re-key the lock to your existing system or replace it with a high-security key system you may already have at your facility. Swing doors feature commercial duty cylindrical key locks normally with lever handle lock. 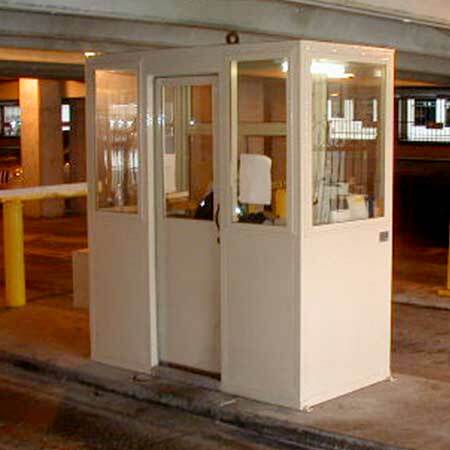 Little Buildings has more standard features than competitors, there is a thumb turn on the inside allowing the attendant to lock the door from the inside affording security. The lock itself is an Assa-Abloy© Adam-Rite maximum security hookbolt. The massive 8-ply laminated stainless steel with Alumina Ceramic core defeats any hacksaw attach while hook bolt shape repels prybar attempts to spread door from its jamb or lift it off its track. Bolt is provided in a hook shaped to resist the parting motion of sliding door and jam. The over center locking action assures that force entry attempts to pry the door in any direction , up, down, or sideways, will be defeated. You won't find this as a standard feature on competitors guard shacks, ticket booths, or cashier booths! Some competitors use a powder medal flip up lever behind the door which is cheap at best and breaks easily. Our customers are thrilled at the improvement we offer as a standard feature! Trust Little Buildings to provide you the best in portable steel buildings! Roll-down mylar sun shades (keeps operators from taping newspapers in windows! 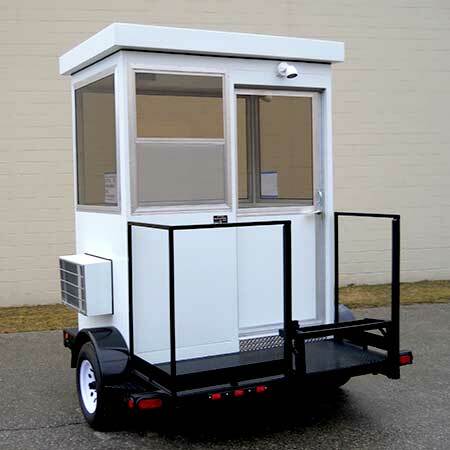 Many other features are available for your guard shack or other Little Building, contact a sales professional at 1-888-55-BOOTH (1-888-552-6684) or email your questions to our staff at info@littlebuildingsinc.com . We are happy to assist you! HVAC options: Combination wall or roof mounted units Additional electrical outlets are always popular to plug in phone or walkie-talkie rechargers, micro- wave ovens, exhaust fans, GFCI outlets are now standard! Three phase electrical panels are available as well as whole-house surge suppressors. Larger heaters and additional units are available. Standard interior lighting is energy saving fluorescent complete with lense, not bare bulbs like some of our competitors. We use a commercial wall mounted light switch while others make you fumble for the cheap switch somewhere on their light. Little buildings engineers have engineered a complete package and are constantly improving. Our customers often tell us they can't believe what they get for their money!